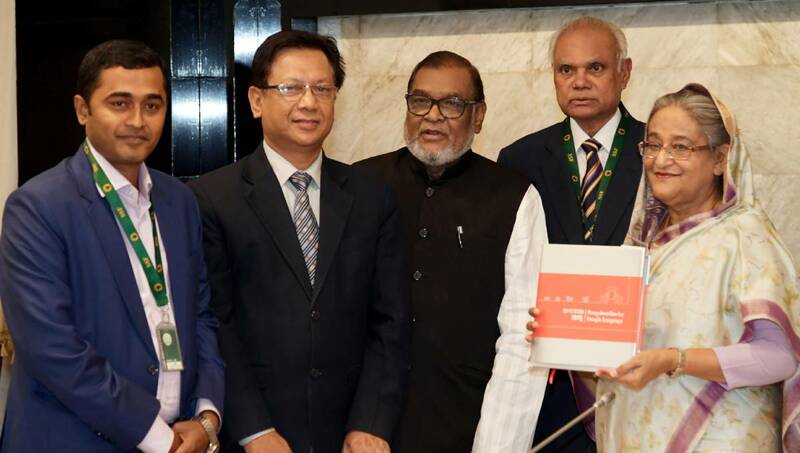 Dhaka, Mar 18 : Prime Minister Sheikh Hasina on Monday unveiled the cover of a book titled ‘Bangla Bhashar Bangabandhu’, which illustrated the contributions of Bangabandhu Sheikh Mujibur Rahman to the Language Movement and Bangla. She uncovered the pictorial book at the outset of cabinet meeting held at the Prime Minister’s Office, said Cabinet Secretary Mohammad Shafiul Alam while briefing reporters at the Secretariat. Under the supervision of the Liberation War Affairs Ministry, the Journey Publication has published the book that contains documentary evidences, pictures and articles about the historic contributions of the Father of the Nation. Earlier, Liberation War Affairs Minister AKM Mozammel Haque and Acting Secretary of the ministry SM Arif-ur-Rahman handed over the book to the Prime Minister. Chairman of Journey Publication Prof Dr Khandakar Bazlul Haque and editor of the book Nazmul Hossain were also present. The Cabinet also adopted a condolence motion over the casualties in the recent Christchurch mosque attacks in New Zealand. It expressed deep shock at the death of 50 people, including five Bangladeshis, in the attacks and expressed sympathy for the bereaved family members. The Cabinet greeted Prime Minister Sheikh Hasina for winning the Lifetime Contribution for Women Empowerment Award. Institute of South Asian Women (ISW) honoured Sheikh Hasina with the award on the occasion of the International Women Day 2019. On March 7, Bangladesh Ambassador to Germany Imtiaz Ahmed received the award on behalf of the Prime Minister.